As seems to happen every several years, Pattaya officials are again promising to repair and upgrade the city’s long-neglected Youth Sports Center after another round of complaints about dilapidated facilities, broken equipment and flooding. 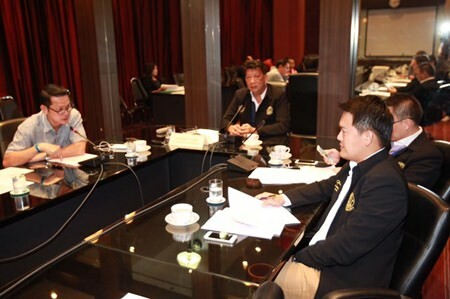 Chairing an April 1 Sports and Recreation Committee meeting, Councilman Praiwan Arromchuen said fellow council members and engineers would survey the situation at the 12-rai complex off Thepprasit Soi 4 to validate the complaints for themselves. Praiwan Arromchuen, President of Sports and Recreation commission, Pattaya City Council, chaired the meeting with the relevant sectors. At the meeting, city engineering staffers said that the center is located in a low-lying area and the construction of high rise condominiums around it have added to flooding problems, as all the buildings had their foundations raised. Now storm runoff flows into the youth center’s fields and pools there, rending the facility useless for days. Built in 2006, the center was heralded as a valuable resource for area youths, but was quickly neglected. In July 2010, city council officials toured the site to find a football field covered in dead grass, a track-and-field area that had collapsed and broken showers at the swimming pool. The politicians pledged to submit a report and budget request so repairs can be made quickly. In January 2013, Praiwan said the field was still often used for non-sporting events, leaving it in need of restoration. Furthermore, he called for construction of a hostel to house athletes staying in Pattaya for youth-sports events and for various areas within the center to be brought up to an acceptable standard. But on April 5 he and other officials were scheduled to be back there again, surveying the decay and promising yet another budget request to make the now 10-year-old center more than that “dilapidated embarrassment” Praiwan called it in 2010.